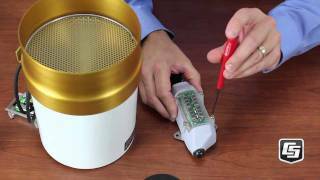 The CWS220 is a wireless version of our SI-111 infrared radiometer. It measures the surface temperature of an object without physical contact. This radiometer has an internal 900 MHz spread-spectrum radio that transmits data to a CWB100 Wireless Base Station or to another wireless sensor. The frequency of the CWS220's internal radio is commonly used in the US and Canada. This product will be discontinued as of 10 April 2017. Please review the CWS-Series and CWB-Series Discontinuation Notice for further details. The CWS220 includes a thermopile, which measures surface temperature, and a thermistor, which measures sensor body temperature. The two temperature sensors are housed in a rugged body that contains a germanium window. It is battery powered using either alkaline batteries or a rechargeable battery and a solar cell. The CWS220 can route its transmissions through up to three other wireless sensors. A data logger is connected to the CWB100 base station for processing and storing its data. The CWS220 interfaces with a PC for configuration via the A205 CWS Sensor to PC Interface. The calibration coefficients used for determining the target temperature by means of the Stefan-Boltzman equation are stored in the CWS220 at the time of calibration. There are situations when it is desirable to make measurements in locations where the use of cabled sensors is problematic. Protecting cables by running them through conduit or burying them in trenches is time consuming, labor intensive, and sometimes not possible. Local fire codes may preclude the use of certain types of sensor cabling inside of buildings. 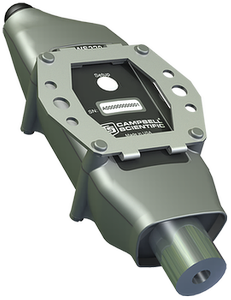 In some applications measurements need to be made at distances where long cables decrease the quality of the measurement or are too expensive. There are also times when it is important to increase the number of measurements being made, but the data logger does not have enough available channels left for attaching additional sensor cables. Note: The internal radio is not designed to move a lot of data quickly. It takes 15 to 30 seconds per hop when moving data from a sensor, through a sensor used as a repeater, and ending up at the base radio. Going through three repeaters could take a data packet anywhere from 45 to 90 seconds to get to the base radio. 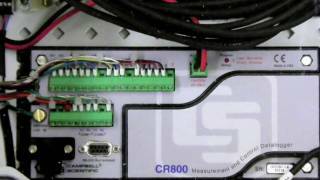 CR6 The CR6 datalogger must have data logger OS version 4.0 or higher. The CWS220 mounts to a mast or pole via the the 26054 bracket. It is mounted at an appropriate distance from the target where it can measure an individual leaf, a canopy, or any surface of interest. Because the CWS220 is wireless, it can be mounted in many locations that would be problematic for a cabled sensor. Latest firmware for the CWS220. The Wireless Sensor Planner is a tool for use with Campbell Scientific wireless sensors. It assists in designing and configuring wireless sensor networks. Is it necessary to purchase an A205 CWS Sensor-to-PC Interface for use with a CWS655, CWS220, or CWS900? An A205 is required to write the radio address of the wireless base station to the wireless sensor firmware so that the sensor will respond to polling from the base station. This is done using the Device Configuration Utility software. The A205 is also useful for connecting a computer directly to the CWS655, CWS220, or CWS900 for diagnosis, changing the base station radio address, uploading new firmware, and verifying sensor functionality. It is only necessary to purchase one A205—unless multiple users with multiple computers need to perform these tasks. Would there be any issues with installing 900 MHz wireless devices at stations that use 900 MHz radios for communication? Would this cause too much noise interference? Because the devices and the radios use the same frequency bands, there will be interference. Factors affecting the amount of interference include the distances between the communications radio and the CWS radios, and the distances between the CWS base and the sensors. Also, the amount of interference is affected by whether the communications radio is set up as a master.